Find My Friends is an application that was released back in 2012, its purpose was to help users connect with their friends and families, and easily locate them. This application can be installed on iPhones, iPads and iPod touch devices, all you need to do is invite your contacts to share their locations, or to enter their email addresses. Why would you want to share your location with someone? Well, let’s say that you want to visit a friend who lives abroad and you need to be picked up from the airport. By sharing your location, your friend will easily track you and will find you before you get lost in the airport. But, what you didn’t know is that “Find My Friends” can be also used to spy on your friends. How? We’ll tell you more below. Find My Friends can be installed on iDevices running on iOS 8.0, which means that only the iPhone 5, 6 and 6 Plus smartphones are supported. The latest version is 4.0.1 was launched on 16 October 2014, being available on iTunes. The installation file has a size of 6.1MB and the application is available in almost 40 languages, but you’ll be required to create a free Apple ID, in order to use iCloud on your device. After installing Find My Friends on your device, you will need to send an invitation (quick request) to a friend who also uses this application, then you’ll start following his/her location. The problem is that if your friend no longer wants to be followed, he/she can hide his/her location. With this application, you will be notified when your child is heading home from school, or when a friend or family member arrives in the train station or at the airport and if you’re changing your location, you will notify the persons who are following you. Find My Friends has some simple privacy controls and parental restrictions, so, if you want to follow someone’s location, you will need consent from that person. So far, so good. But, this isn’t all you can do with this application, because if you want to enable Find My Friends on another iPhone and share the owner’s location, without asking for consent from him/her, you can do that (incognito). After turning on the option on your friend’s device, you can track his/her location and you won’t appear as a “stalker”, but only as a “follower” – if that person realizes that you are spying on him/her, because he/she won’t receive any notification or alert. After setting up the application, you can set reminders for yourself, to be informed when your wife goes after work, or if your teenager is having fun in a dubious club, or if your parents/grandparents know where they are going. If you get your hands’ on your “victim’s” iPhone, you will need to go to Settings, then tap on his/her contact picture, which is located at the bottom, you’ll then need to enable the “Share My Location” option. The location must be shared from “This Device”, which is found in Settings> Share My Location From. You will need to do this because you might have other devices attached to the same iCloud account, such as an iPad. Now, all the magic will happen on your iPhone. You will need to enable “AirDrop” from the Control center, by swiping up from the bottom of the screen, and select to be discoverable to “Everyone”. While you’re running the application, tap on the Add button, then on the contact icon and select “Share Indefinitely”. 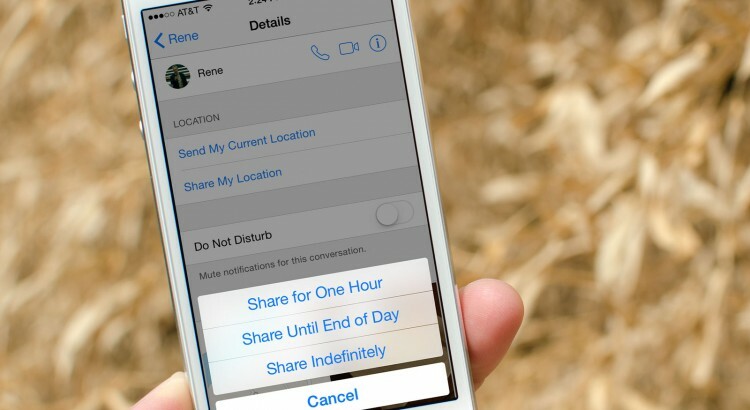 Your friend’s location will be shared to your iPhone for as long as you want. 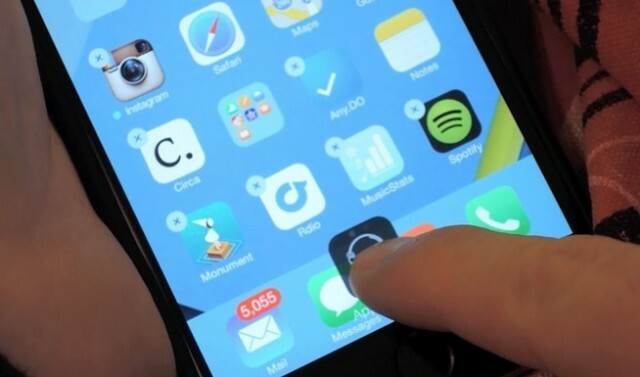 You will receive a request from your friend’s device, so tap on Accept. Immediately, a pop up will show up and you will be asked if you want to share your location with that contact, so decline it by tapping on “Don’t Share”. This way, your friend will not be able to track your location, but you’ll track every move he/she makes. Find My Friends is an application that is very simple to use, and to find out someone’s location (in real time), you will just click on his/her contact icon. You will get notified when that person goes out the door and arrives to a certain location. Now that we taught you how to enable the “Share My Location” option on someone’s phone, there are some ways to hide the application so that your friend won’t even know it’s there. This is a measure of precaution, but if your victim ventures into his/her device, to check what applications has installed, there is a high chance they will find out that there’s an “intruder” installed on his/her iPhone.